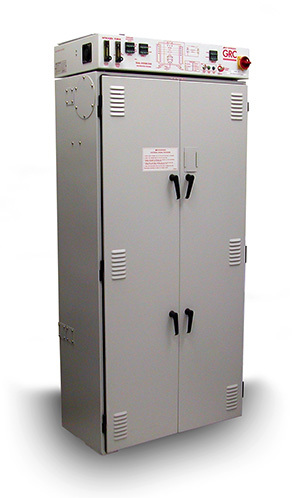 The Edwards D150 Gas Reactor Column (GRC) is a hot bed reactor designed to abate semiconductor exhaust gases in a production level environment, such as a Semiconductor Fab. Like other non-hybrid abatement systems, the GRC can be configured to treat gases from a limited range of processes. The most common application for a GRC is metal etch (acid) abatement, however it can also be configured for Implant, LPCVD and other applications by utilizing different cartridges and altering other internal componentry. The D150 is a single inlet system, requiring 3 Phase voltage to power its cartridge heaters, valves and control system. Unlike the M150, which has a single cartridge, the D150 cabinet houses (2) cartridges. The “on-line” cartridge is actively used for abatement, will the “stand-by” cartridge is at temperature and available to be used when the “on-line” cartridge reaches its endpoint. This setup eliminates the tool downtime that would otherwise be associated with a cartridge change. The GRC is typically integrated into the parent tool or chamber’s control system such that unit’s status (on or offline) is known to the equipment operator. Trillium provides end users with refurbished D150 GRCs, repairs and on-site service to improve system reliability and uptime. Specifications for US Version systems are below. M150 specifications included for reference.